I have been spending a lot of time at the zip code level of all things housing lately, including prices, rents, sales, and supply in Oregon. Our office has lots of good work coming on that, however, one item that popped up recently was the impact of rising rents on folks across the income spectrum. FiveThirtyEight’s Ben Casselman examined inflation across income groups, based on consumption patterns and found overall the inflation may be rising fastest for the basket of goods the poor and the rich buy (for different reasons) than it is for those in the middle of the income spectrum. The primary reason inflation may be higher for the lower income households is due to rising rents (housing and utilities account for 45% of spending, compared with about 37% for the wealthiest households), based on the BLS inflation and consumer expenditure survey data. To try and get at the same issue but looking though a different lens, I cross referenced the Zillow rental data by zip code with 2008-12 American Community Survey data on median household income (Spreadsheet: Zip Code Rents). While we know home prices and rents are rising quickly, we also know they’re not rising uniformly across areas. Different cities are seeing larger or smaller increases and neighborhoods within cities are not seeing the same increases, due to various aspects like perceived livability, trendiness, available supply and the like. Putting this all together, we see that rents are actually rising fastest in wealthier zip codes and slowest in lower income zip codes. 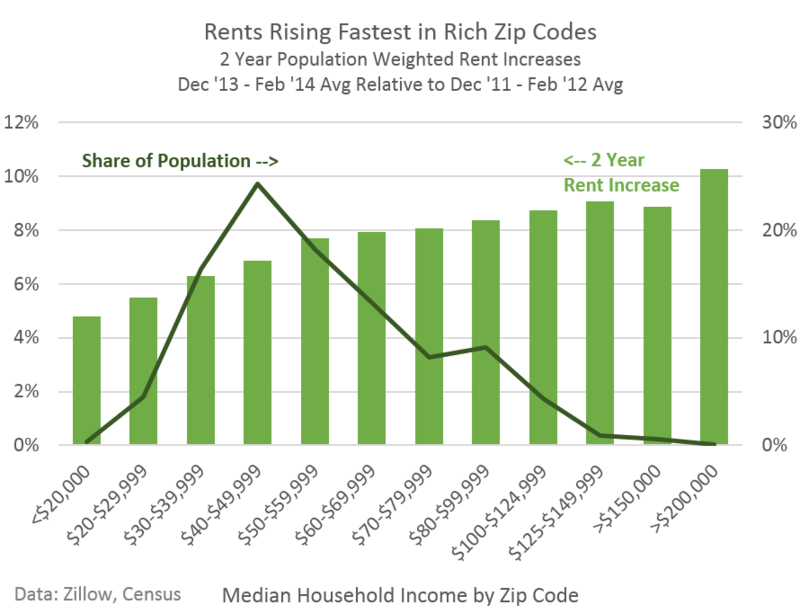 While this look at rising rents is a bit more granular and detailed, unfortunately it still does not fully address the underlying question of how rising home prices and rents are directly impacting individuals across the income spectrum as each zip code has both higher and lower income individuals in it. Bringing it full circle back to Oregon, rents in Portland are rising faster than in Albany and within Portland rents for zip codes in and around downtown are rising faster than, say, east Portland. Adding in spatial analysis and maps may bring another level of understanding to the issue and the impact of rising prices. Our office’s housing affordability measure is hovering just in the threshold range of affordability, but drilling down to the zip code level reveals certain areas are more expensive relative to the median household’s ability to pay than others (more on this later). It’s a complicated issue with different neighborhoods within a city seeing different impacts, but one worth tracking and our office will address some of these topics with our future work on housing at the local level. « Getting There. Financial Crises Edition.